© 1997 by The University of Chicago. All rights reserved. Heart rate, swimming speed, and diving behaviour were recorded simultaneously for an adult female southern elephant seal during her postbreeding period at sea with a Wildlife Computers heart�]rate time depth recorder and a velocity time depth recorder. The errors associated with data storage versus real�]time data collection of these data were analysed and indicated that for events of short duration (i.e., less than 10 min or 20 sampling intervals) serious biases occur. 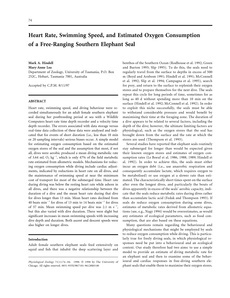 A simple model for estimating oxygen consumption based on the estimated oxygen stores of the seal and the assumption that most, if not all, dives were aerobic produced a mean diving metabolic rate of 3.64 mL O2 kg−1, which is only 47% of the field metabolic rate estimated from allometric models. Mechanisms for reducing oxygen consumption while diving include cardiac adjustments, indicated by reductions in heart rate on all dives, and the maintenance of swimming speed at near the minimum cost of transport for most of the submerged time. Heart rate during diving was below the resting heart rate while ashore in all dives, and there was a negative relationship between the duration of a dive and the mean heart rate during that dive for dives longer than 13 min. Mean heart rates declined from 40 beats min−1 for dives of 13 min to 14 beats min−1 for dives of 37 min. Mean swimming speed per dive was 2.1 m s−1, but this also varied with dive duration. There were slight but significant increases in mean swimming speeds with increasing dive depth and duration. Both ascent and descent speeds were also higher on longer dives.